This is the first of two posts dedicated to The 90 Years of Jean Simmons Blogathon which will be taking place over at Wonderful World of Cinema and at Phyllis Loves Classic Movies. Brief Synopsis – After suspecting her employer of murdering his wife, a maid blackmails him into loving her, but things are never as they seem. My Take on it – This is a film that I chose to review for this blogathon based solely on the fact that the premise sounded quite interesting. Unfortunately, it fails to work as well as one could have hoped because the way things are presented is quite lackluster. 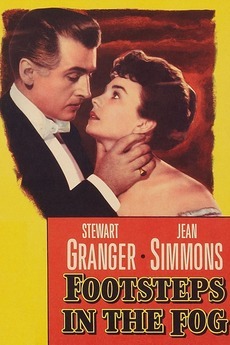 The cast is quite good and both Stewart Granger and Jean Simmons do nice jobs with the characters they are given. Both show how diabolical they can be when given the opportunity and the battle of wits between them is intriguing to watch unfold. Unfortunately, it’s quite hard to take everything they say and do quite seriously because eventually things get a bot too absurd along the way. The story is a good one yet they don’t manage to keep it powerful or exciting enough and it sometimes feels like it is just going through the motions instead of feeling impactful. This film has some interesting twists and turns along the way but this kind of story has been done so much better in other instances that this just doesn’t manage to be among the best of this kind of story. Bottom Line – Interesting premise that unfortunately doesn’t work as well as it could. Both Granger and Simmons give nice performances here, but it’s hard to take everything they do seriously because things get a bit too absurd. They story isn’t shown powerfully enough and that takes away from the way that this story can be impactful. The twists and turns are interesting but thuis kind of story has been done much better. I haven’t seen this film yet so I don’t know how I’ll like it. Sometimes it’s worth it though to watch a movie solely for a favorite actor or actress. Maybe it will be better on a rewatch! Thanks for participating in the blogathon! Funny, we both watched this film for the first time on the same day lol! Great article Rob. I agree with you that despite being intruiguing there somehow was something missing in this film to make it completely perfect. I must admit that despite being very chilling, the ending kind of left me “meh”. But overall I quite enjoyed the film, especially the foggy cinematography as I’ve said to Maddy on her post. Thanks so much for your participation to our blogathon! Btw, you said this was your second entry for the blogathon, but I couldn’t find the first one!